5th April 2014 Picture update taken 5th April of Peas and Broad Beans that were sown 3rd March and planted out 19th March. Potato: Charlotte, King Edward and Pink Fir Apple planted out. Second lot of Onions (Sturon) planted out under fleece. 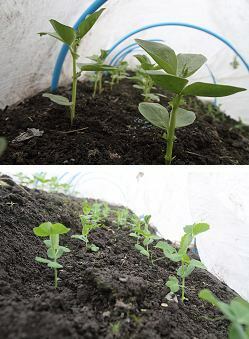 Broad bean and pea that were sown on 3rd March planted out under fleece. First batch of onion setts (Sturon) planted out under fleece. Sowed Leek; Musselburgh in a pot. Sowed lettuce in pots; Amaze, Tom Thumb, Little Gem and Rocket. The Broad bean; Masterpiece Green Longpod, and Pea; Hurst Greenshaft, that were sown in pots on 3rd March are now showing. Planted garlic out, 3 bulbs of garlic grown last year and 2 bought called Germidour. 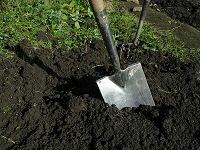 Like to plant Garlic in Nov-Feb time as it needs a cold spell, but the winter has been mild and the ground has been too wet. Sowed Broad bean; Masterpiece Green Longpod, and Pea; Hurst Greenshaft, in pots. Raked ground over and put fleece on to warm ground for when peas and beans are ready to plant out in a couple of weeks time. Picked first Rhubarb which was being forced by putting a cover over it which is now off. grow. Bought potatoes; Pink fir apple, King edward and Charlotte from local garden centre, which are now chitting. A very good website is Dan's www.allotment-diary.co.uk He is growing in the Yorkshire Dales with similar conditions to Haworth. His site is updated frequently and he gives advice about growing veg for eating and showing.